Our professionals use a comprehensive approach to audit services, client’s tasks and provide possibility to obtain all necessary information from one source. Trust of our clients was conquered by consistently high quality of services ensured by the years of continuous, intensive and successful work. Individual approach to each client and understanding business needs, as wells as its specific features allow to solve tasks quickly and efficiently and achieve maximum profitability. Our clients are the best confirmation of high quality of services provided by Consulting Ltd. We are working with more than 200 big- and medium-size companies, foreign representative offices, financial and state institutions. Cost of our services depends on scope of performed procedures and is determined individually. If it is impossible to determine scope of work, we suggest hourly payment for our experts’ work. We render wide range of services and provide for relevant procedures regarding confidentiality of information received by us and transferred to client. We are materially liable for non-execution or improper execution of our services. 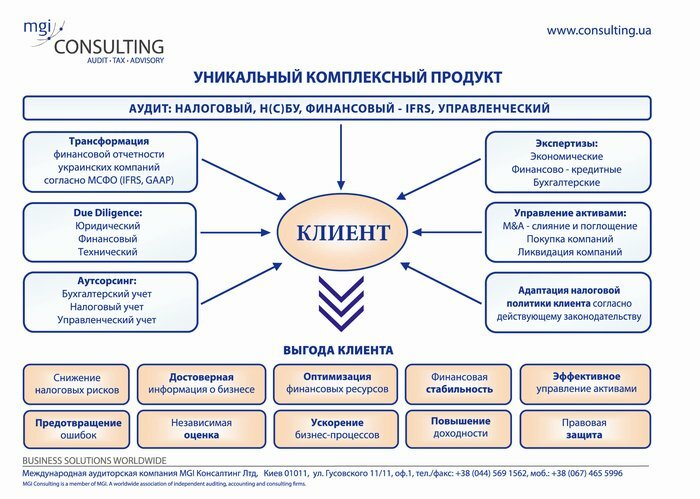 Audit risks of Consulting Ltd are insured by the for 1 000 000 Hryvnias.